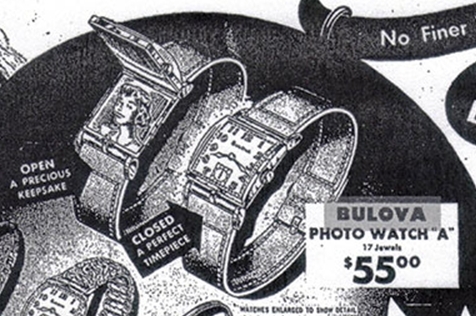 1950 Bulova Photo Watch. Case and movement marked L0. From a local estate dresser drawer without a crystal. I cleaned it up, installed a period band, gave it a wind and it has been keeping time for 24 hrs. Neat 1952 personal engraving on back. It appears there are currently 4 documented variants of this watch in the Db. Yellow Gold plate w/ no engraving like subject watch - unknown variant. Ads for these seem to be few and far between. According to a 2014 Photo Watch thread (per Ken), watch takes a "Watchcraft 10MA211" or "GS-CMX 324-6" Crystal. Anyone have one they would be willing to part with? The pricelists call for three variants, A & B like you mentioned, and C (#38771) which is the one with white gold bezel at $71.50. There is no fourth variant listed. The ads we have do not clearly show the engraved bezel for the 'A'. Are we sure the 'A' variant has engravings? Perhaps it the the plain bezel with a strap; looks plain to me, as the dashes or marks appear to be in the crystal, depicting the minutes track. As for the crystal, the GS CMX 324-6 covers several models (ACADEMY AWARD Y, AERONAUT, AUTO WATCH C, BRIGADIER, BRIGADIER B, DORRANCE, DOUGLAS D, ENGINEER A, HARRINGTON, PHOTO WATCH); and I have one to spare if you need. Msg me your details. Based on your example "C" shown above w/string tag and Geoff's "B" with tag, It's entirely possible that "A" is unengraved on leather, B is engraved all yellow on metal and "C" is "two tone" on metal. I agree, Ad is pretty vague and may be showing the seconds track as opposed to engraving. It's a tough call. 1950 Bulova Photo Watch. The "A" looks like a match to me but not knowing how they determined the variant on these not 100% sure. After revisiting this watch several times, I'm on board with Ken. Here is an enlarged snip from the ad. If you look at the lines, you can see the smooth flat stripe on the bezel next to the crystal, the seconds track inside and the top edge of the crystal. Ad isn't showing engraving. Unengraved is the "A" variant. Here is another view of the 'A'. I do not see any engravings. I am on board with Photo Watch 'A' for subject watch. Crystal installed, many thanks to Ken!